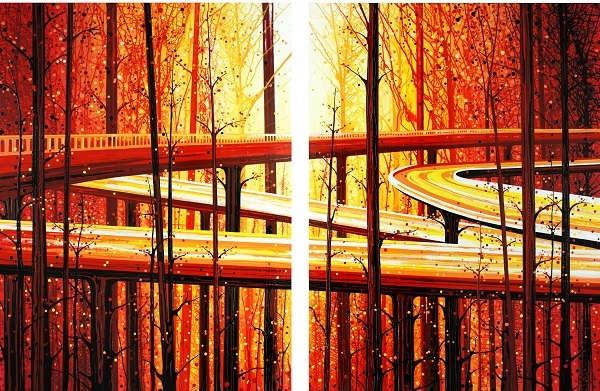 “Treeway” (San Francisco + Vancouver), July 2014, 60” x 90″ diptych, acrylic and enamel on canvas. Photo Credit: Amy Shackleton. The last time we wrote about Amy Shackleton’s impeccably brilliant landscapes, she was working on a new series that would expose recent developments of sustainable buildings across Canada. 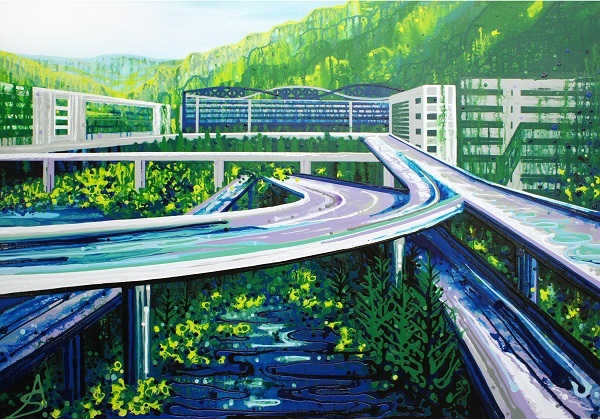 Two years later, the Toronto based artist is back with Down The Road, a sequence of paintings that combines elevated roadways with natural elements. You won’t find any cars or people in this series. Instead, you’ll be faced with green spaces and landscapes, reminiscent of the likes of Yosemite National Park or the Rocky Mountains, combined with the industrial infrastructure that presides in large cities like New York. 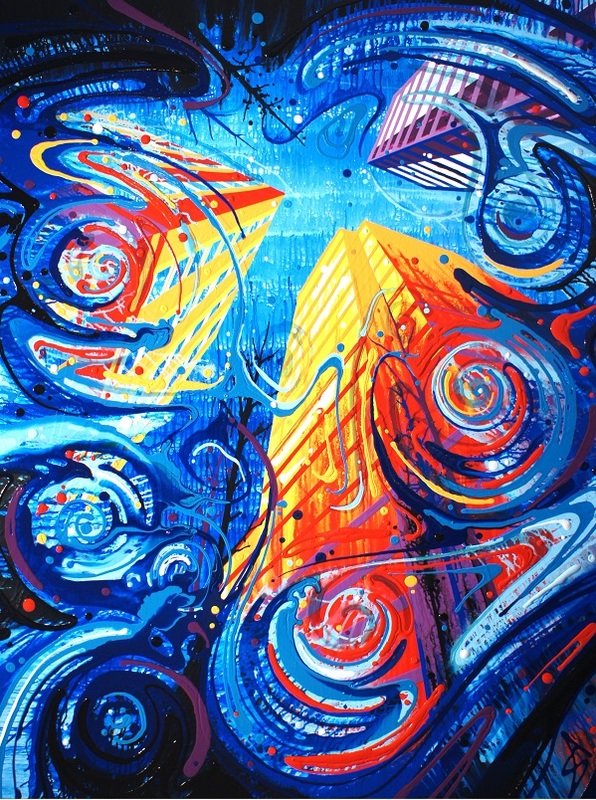 Bursting with vibrant hues and environmental connotations, the 28-year-old visionary hopes that her paintings will serve as inspiration to viewers and instill a sense of duty in preserving the natural habitat that surrounds us; her desire being that humans learn to work with nature and not rebel against it, preventing the destruction of the very essence of life. 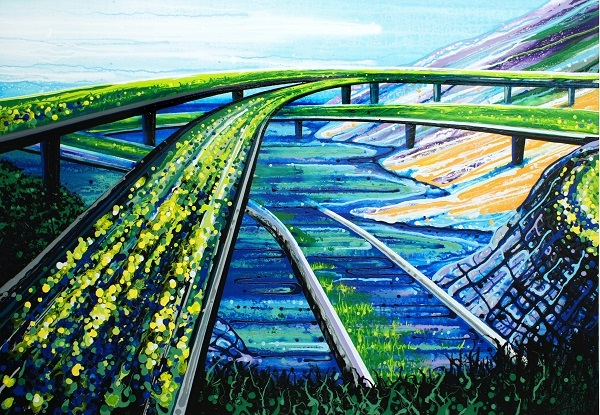 “At The Crossroads” (California), June 2014, 35” x 50″, acrylic and enamel on canvas. Photo Credit: Amy Shackleton. 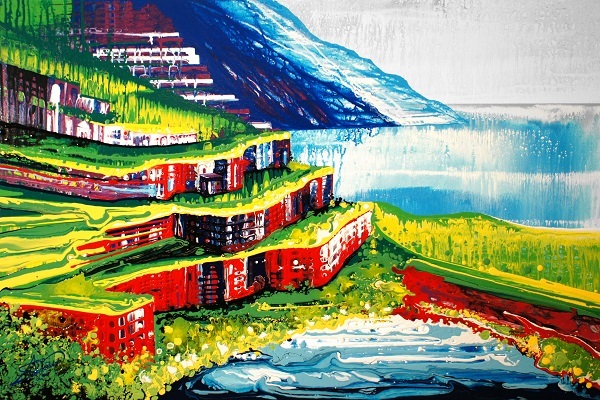 “Coastlines,” (Amalfi Coast), 30” x 45”, March 2012, acrylic and enamel on canvas. Photo Credit: Amy Shackleton. 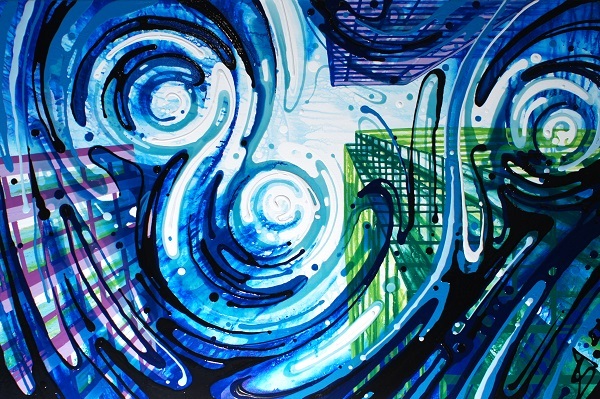 “Into the Puddle” (Toronto + Muir Woods), 2013 30” x 45”, acrylic and enamel on canvas. Photo Credit: Amy Shackleton. And the finished paintings won’t be the only thing to leave you in awe. Her unique drip technique, usually reserved for abstract paintings and which made her a viral sensation on YouTube with over one millions views, is nothing short of hypnotizing, if not delightful, to watch. Suffice it to say, folks in the U.S. are in for a colorful treat as she makes her way to the Mike Wright Gallery in Denver, Colorado for her first-ever solo exhibition and live demonstration in the neighboring northern country. “Go With The Flow” (California + Croatia), June 2014, 35” x 50”, acrylic and enamel on canvas. Photo Credit: Amy Shackleton. “Surface Tension”(Toronto + Muir Woods), 2014, 45” x 60”, acrylic and enamel on canvas. Photo Credit: Amy Shackleton. Video courtesy of Amy Shackleton. Amy Shackleton will be in attendance at the Mike Wright Gallery — located at 1412 Wazee Street in Denver, Colorado — from August 7th to August 8th. The live demonstration will take place on August 8th from 6 to 9 p.m. “Down The Road” will be on exhibit from August 7th through September 5th, 2014. For more information about the exhibition, please click here or call 303-590-9800.